Kia has built its reputation offering affordable family transportation full of features and costing thousands less than the competition. The 2015 Kia Sorento crossover SUV is a perfect example, combining safety, comfort and fuel economy in a package that can be loaded with premium features. Great car, for families or growing ones. I bought this car because we had just had our daughter and at the time we had a smaller vehicle that was a lot harder to get a car seat in and out of it. While I was car shopping I had many things I wanted my car to have which was: room- I needed lots of space, I have long legs and we like to go out of town often so space and comfort was a must. Also, sunroof, I live in California and enjoy my California sun, what can I say. And last family friendly, and by that I mean leather seats lol I needed something I could just wipe down. Let me tell you my Kia Sorento has leather seats, a giant sun roof that goes all the way to the back seats and 3 row seating that is easily accessible. It has sun protection sheets that roll up and down built into the back windows. The back side of the front seats have hard plastic on them to protect from little feet. The only problems I have come into with my vehicle was that my 7 year old 40 pound niece was able to rip my door handle off during one of her fits and my door does not work now all together, so I don't what's that to say about the rest of the body work. But other than that I get great gas mileage and haven't run into any problems with it in the 3 years and 12, 000 miles I've put on it. 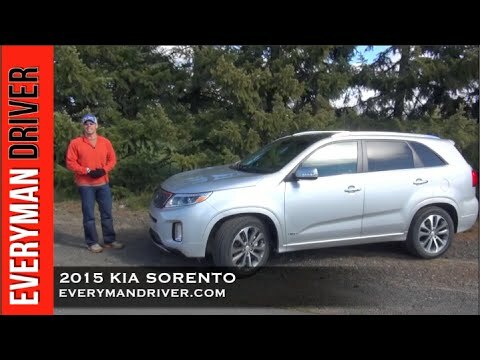 Kia Sorento: best vehicle I have owned. I love my Kia Sorento! The gas mileage is amazing. There are no blind spots which is something important we look for in vehicles in my family. I do not think we have had an issue with the vehicle since we've owned it except for maybe tire pressure. They come with nitrogen in the tires which is a molecule that shrinks in cool temperatures, but we just put a little air in it and they were good to go! Like I said, the gas mileage is amazing. When I fill the tank all the way up I get 400 miles till empty. The vehicle just rides super smooth in general. Since we have not had a major problem in 2 years (knock on wood) I would say that it is a very reliable vehicle. We got a model that does not have all the bells and whistles, but it is enough for me! The seats are cloth and comfortable. The radio allows you to play music with an AUX cord, USB, or even Bluetooth. You can also take on the phone through the radio as well through Bluetooth which is really nice if you live in a hands free state. The center console is super roomy which is also nice. Kia Sorento - perfect family vehicle. I love the space in my Sorento. I have the added third row that folds down for additional storage/trunk space if needed. The middle row also folds down or slides up to add even more space if needed. The ride overall is smooth and actually made it over 71, 000 miles on the original set of tires. Changing the light bulbs were super easy, with easy installation without having to move thing around to remove and insert the bulb. The AWD has been amazing during the few snow storms we've had here in Virginia. My Sorento handles very well, and has yet to give me any issues when driving in deep snow or slippery roads. My favorite extra options are the Bluetooth, Sirius radio, heated seats, and my all time favorite backup camera. That camera has made backing up in dark areas so much easier and less stressful. My kids also enjoy the back pull up sun shade for the back windows. Cuts down the glare of the sun from their electronics to help them get through the long drives we make.